The Department of Education is investigating USC's handling of sexual harassment claims against a former university doctor. 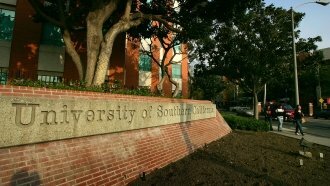 The University of Southern California is under federal investigation. The U.S. Department of Education announced it is looking into how the university handled allegations of sexual harassment against a former gynecologist. The Los Angeles Police Department said last month it was investigating complaints from 52 people accusing Dr. George Tyndall of inappropriate behavior. USC received complaints about Tyndall "as early as 1990 that were not fully investigated by the University until spring 2016," according to the Department of Education. In late May, USC President C.L. Max Nikias announced he would step down after calls for his resignation. But according to the Daily Trojan, Nikias has not left the position and his replacement has not been named. U.S. Secretary of Education Betsy DeVos said in a statement, "No student should ever endure sexual harassment or abuse while trying to pursue their education."